Did You Hear the One About the Hungry Judges? The AVI sent me an article this week about a hungry judge study I’ve heard referenced multiple times in the context of willpower and food articles. Basically, the study shows that judges rule in favor of prisoners requesting parole 65% of the time at the beginning of the day and 0% of the time right before lunch. The common interpretation is that we are so driven by biological forces that we override our higher order functioning when they’re compromised. The article rounds up some of the criticisms of the paper, and makes a few of its own…namely that an effect size that large could never have gone unnoticed. It’s another good example of “this psychological effect is so subtle we needed research to tease it out, but so large that it noticeably impacts everything we do” type research, and that should always raise an eyebrow. Statistically, the difference in rulings is as profound as the difference between male and female height. The point is, everyone would know this already if it were true. So what happened here? Well,this PNAS paper covers it nicely but here’s the short version: 1) the study was done in Israel 2) This court does parole hearings by prison, 3 prisons a day with a break in between each 3) prisoners who have legal counsel go first 4) lawyers often represent multiple people, and they chose the order of their own cases 5) the original authors lumped “case deferred” and “parole denied” together as one category. So basically the cases are roughly ordered from best to worst up front, and each break starts the process over again. Kinda makes the results look a little less impressive, huh? I can’t remember who suggested it, but I saw someone recently suggest that biology or nutrition papers in PubMed or other journal listings should have to include a little icon/picture at the top that indicated what animal the study was done on. They were attempting to combat the whole “Chemical X causes cancer!” hoopla that arises when we’re overdosing mice on something. I would like to suggest we actually do the same thing with countries, maybe use their flags or something. Much like with the study above, I think tipping people off that we can’t make assumptions things are working the same way they work in the US or whatever country you hail from. I was thinking about that when I saw this article from Slate with the headline “Do Women Like Being Sexually Harassed? Men in a New Survey Say Yes“. The survey has some disturbing statistics about how often men admit to harassing or groping women on the street (31-64%) and why they do it (90% say “it’s fun”), but it’s important to note it surveyed men exclusively in the Middle East and Northern Africa. Among the 4 countries, results and attitudes varied quite a bit, making it pretty certain that there’s a lot of cultural variability at play here. While I thought the neutral headline was a little misleading on this point, the author gets some points for illustrating the story with signs (in Arabic) from a street harassment protest in Cairo. I only hope other stories reporting surveys from other countries do the same. In my last post about gerrymandering, I mentioned that some computer models showed that independent commissions did a much better job of redrawing districts than state legislatures did. Yet another computer model is disputing this idea, showing that they aren’t. To be honest I didn’t read the working paper here and I’m a little unclear over what they compared to what, but it may lend credibility to the Assistant Village Idiot’s comment that those drawing district maps may be grouping together similar types of people rather than focusing on political party. That’s the sort of thing that humans of all sorts would do naturally and computers would call biased. Clearly we need a few more checks here. As an update to my marathon times post, I recently got sent this websites report that showed that US runners for all distances are getting slower. They sliced and diced the data a bit and found some interesting patterns: men are slowing down more than women and slower runners are getting even slower. However, even the fastest runners have slowed down about 10% in the last two decades. They pose a few possible reasons: increased obesity in the general population, elite runners avoiding races due to the large numbers of slower runners, or in general leaving to do ultras/trail races/other activities. On a only tangentially related plus side, I thought I was seriously slowing down in my running until I discovered that my treadmill was incorrectly calibrated to the tune of over 2 min/mile. Yay for data errors in the right direction. Okay, I just said I was blogging less, but this story was too interesting to pass without comment. A few days ago it was announced that the Supreme Court had agreed to hear a case about gerrymandering, or the practice of redrawing voting district lines to influence the outcome of elections. This was a big deal because previously the court has only heard these cases when the lines had something to do with race, but had no comment on redraws that were based on politics. The case they agreed to hear was from Wisconsin, and a lower court found that a 2011 redistricting plan was so partisan that it potentially violated the rights of all minority party voters in the affected districts. Now obviously I’ll leave it to better minds to comment on the legal issues here, but I found this article on how statisticians are getting involved in the debate quite fascinating. Obviously both parties want the district lines to favor their own candidates, so it can be hard to cut through the noise and figure out what a “fair” plan would actually look like. Historically, this came down to just two parties bickering over street maps, but now with more data available there’s actually a chance that both gerrymandering and the extent of gerrymandering can be measured. Suppose, for example, that a state has five districts with 100 voters each, and two parties, Party A and Party B. Suppose also that Party A wins four of the seats 53 to 47, and Party B wins one of them 85 to 15. Then in each of the four seats that Party A wins, it has 2 surplus votes (53 minus the 51 needed to win), and Party B has 47 lost votes. And in the lone district that Party A loses, it has 15 lost votes, and Party B has 34 surplus votes (85 minus the 51 needed to win). In sum, Party A wastes 23 votes and Party B wastes 222 votes. Subtracting one figure from the other and dividing by the 500 votes cast produces an efficiency gap of 40 percent in Party A’s favor. Basically this metric highlights unevenness across the state. If one party is winning dramatically in one district and yet losing in all the others, you have some evidence that those lines may not be fair. If this is only happening to one party and never to the other, your evidence grows. Now there are obvious responses to this….maybe some party members really are clustering together in certain locations….but it does provide a useful baseline measure. If your current plan increases this gap in favor of the party in power, then that party should have to offer some explanation. The author’s proposal is that if the other party could show a redistricting plan that had a smaller gap, the initial plan would be considered unconstitutional. To help with that last part, two mathematicians have created a computer algorithm that draws districts according to state laws but irrespective of voting histories. They then compare these hypothetical districts “average” results to the proposed maps to see how far off the new plans are. In other words, they basically create a normal distribution of results, then see how the current proposals line up. To give context, of the 24,000 maps they drew for North Carolina, all were less gerrymandered than the one the legislature came up with. When a group of retired judges tried to draw new districts for North Carolina, they were less gerrymandered than 75% of the computer models. Now again, none of these methods may be perfect, but they do start to point the way towards less biased ways of drawing districts and neutral tests for accusations of bias. The authors note that the courts currently employ simple mathematical tests to evaluate if districts have equal populations: +/- 10%. It will be interesting to see if any of these tests are considered straightforward enough for a legal standard. Stay tuned! This is not a particularly new question, but a few friends and readers have asked me over the past few months about the data behind the “Evangelicals support Trump” assertions. All of the people who asked me about this are long term Evangelicals who attend church regularly and typically vote Republican, but did not vote for Trump. They seemed to doubt that Evangelical support for Trump was as high as was being reported, but of course weren’t sure if that was selection bias on their part. The first data set of interest is the exit polling from right after Election Day. This showed that Evangelical support had gone up from 78% for Romney to 81% for Trump. The full preliminary analysis is here, but I thought it would be interesting to see how all of the tracked religions had changed over the years, so I turned the table in to a bar chart. This shows the percent of people who claimed affiliation with a particular religious group AND said the voted for the Republican candidate: Since some religions tend to show large disparities along racial lines (such as Catholicism), race is included. White evangelical Christian was added as its own affiliation after the 2000 election, when those voters were given credit for putting Bush in office. Mormonism has not been consistently tracked, which is why the 2008 data is missing. Anyway, I thought it was interesting to see that while support for Trump did increase over Romney’s support, it wasn’t a huge change. On the other hand, Mormons saw a fairly substantial drop in support for Trump as opposed to Romney or Bush. Hispanic Catholics and “other faiths” saw the biggest jump in support for Trump over Romney. However, white Evangelicals remained the most likely to vote for Trump at a full 21 points higher than the next closest group, white Catholics. We don’t actually know the true percentage of Evangelicals who voted for Trump Even with a number like 81% , we still have to remember that about half of all people don’t vote at all. I couldn’t find data about how likely Evangelicals were to vote, but if it is at the same rate as other groups then only 40% of those sitting in the pews on Sunday morning actually cast a vote for Trump. Some who have raised this objection have also objected that we don’t know if those calling themselves “Evangelical” actually were sitting in the pews on Sunday morning, so Pew decided to look at this question specifically. At least as of April, Evangelicals stating that they attended church at least once a month were actually the most likely to support Trump and the job he is doing, at 75%. Interestingly, that survey also found that there are relatively few people (20%) who call themselves Evangelical but don’t attend church often. The pulpit and the pews may have a difference of opinion While exit polls capture the Evangelical vote broadly, some groups decided to poll Evangelical pastors specifically. At least a month before the election, only 30% of Evangelical pastors said they were planning on voting for Trump and 44% were still undecided. While more of them may have ended up voting for him, that level of hesitancy suggests they are probably not publicly endorsing him on Sunday mornings. Indeed, that same poll found that only 3% of pastors had endorsed a candidate from the pulpit during this election. People weren’t voting based on things you hear sermons about After the data emerged about the Evangelical voting, many pundits hypothesized that the Supreme Court nomination and abortion were the major drivers of Evangelical voting. However, when Evangelicals were actually asked what their primary issues were, they told a different story. When asked to pick their main issues, they named “improving the economy”and “national security”, with the Supreme Court nominee ranking 4th with 10% picking it and abortion ranking 7th, with 4%. Even when allowed to name multiple issues, the Supreme Court and abortion were ranked as less concerning than terrorism, the economy, immigration, foreign policy and gun policy. Now the motivation may seem minor, but think about what people actually discuss in church on Sunday morning. Abortion or moral concerns are far more likely to come up in that context than terrorism. Basically, if Evangelicals are voting for Trump based on their beliefs about things that aren’t traditionally talked about on Sunday morning, you are not likely to hear about this on Sunday morning. National breakdowns may not generalize to individual states I couldn’t find an overall breakdown of the white Evangelical vote by state, but it was widely reported that in some key states like Florida, Evangelical voters broke for Trump at even higher rates than the national average (85%), which obviously means some states went lower. What might skew the data even further however, is the uneven distribution of Evangelicals themselves. The Pew Research data tells us that about 26% of the voting public is white Evangelical, and Florida is very close to that at 23%. The states where my friends are from however (New Hampshire and Massachusetts) are much lower at 13% and 9% respectively. This means some small shifts in Evangelical voting in Florida could be the equivalent of huge shifts in New Hampshire. As an example: According to the Election Project numbers, Florida had 9.5 million people cast votes and New Hampshire had 750,000. If Evangelicals were represented proportionally in the voting population, that means about 2.18 million Evangelicals cast a vote in Florida, and about 97,500 cast their vote in NH. That’s 22 times as many Evangelical voters in Florida as NH. Roughly speaking, this means a 1% change in Florida would be about 20,000 people….almost 20% of the NH Evangelical population. Massachusetts Evangelicals are similarly outnumbered at about 7 to 1 in comparison to Florida. If 0% of NH/MA Evangelical voters went for Trump but 85% of Florida Evangelicals did vote for him, that would still average out to 71% of Evangelicals voting for Trump across the three states. New England states just really don’t have the population to move the dial much, and even wildly divergent voting patterns wouldn’t move the national average. Hopefully that sheds a bit of light on the numbers here, even if it is about 7 months too late to be a hot take. I got in to an interesting email discussion this past weekend about a recent Daily Beast article “The Republican Lawmaker Who Secretly Created Reddit’s Women-Hating ‘Red Pill’“, that ended up sparking a train of thought mostly unrelated to the original topic (not uncommon for me). The story is an investigation in to a previously anonymous user who started an infamous subreddit, and the Daily Beast’s discovery that he was actually an elected official in the New Hampshire House of Representatives. Given that I am originally from New Hampshire and all my family still lives there, I was intrigued by the story both for the “hey! that’s my state!” factor and the “oh man, the New Hampshire House of Representatives is really hard to explain to a national audience” level. Everyone I was emailing with either lives in New Hampshire or grew up there (as I did), so the topic quickly switched to how unusual the New Hampshire state legislature is, and how it’s hard for a national news outlet to truly capture that. 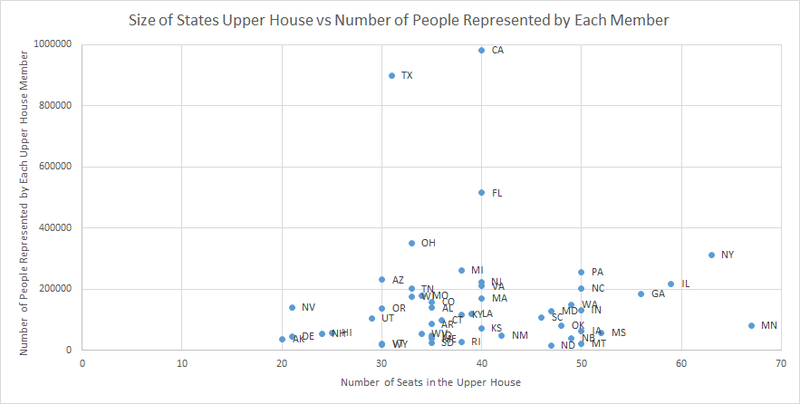 For starters, the NH state House of Representatives has nearly as many seats (400) as the US House of Representatives (435), and double the number of seats of the next closest state (Pennsylvania with 200), all while having a state population of a little over 1 million people. Next is the low pay. For their service, those 400 people make a whopping $200 dollars for a two year term. Some claim this is not the lowest paying gig in the state level representation game, since other states like New Mexico pay no salary, but a quick look at this page shows that those state pay a daily per diem that would quickly go over $200. New Hampshire has no per diem, meaning most members of the House will spend more in gas money than they make during their term. As you can imagine, this set up does not pull from a random sample of the population. This conversation got me thinking about how often state level politicians get quoted in news articles, and got me wondering about how we interpret what those officials do. Growing up in NH gave me the impression that most state level representatives didn’t have much power, but in my current state (Massachusetts) they actually do have some clout and frequently move on to higher posts. This of course got me curious about how other states did things. When lawmakers from individual states make the news, I suspect most of us assume that they operate much the same way as lawmakers in our own state do and that could lead to confusion about how powerful/not powerful the person we’re talking about really is. Ballotpedia breaks state legislatures down in to 3 categories: full time or close (10 states), high part-time (23 states), low part-time (17 states). A lot of that appears to have to do with the number of people you are representing. I decided to do a few graphs to illustrate. Note: Nebraska doesn’t have a lower house, at least according to Wikipedia. NH and CA are pretty clear outliers in terms of size and population, respectively. 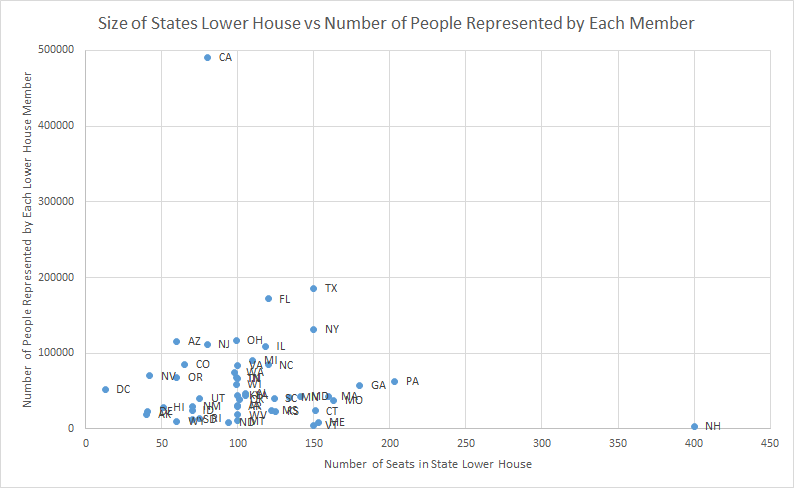 So next time you read an article about a state level representative doing something silly, keep this graph in mind. For some states, you are talking about a fairly well compensated person with lots of constituents, who probably had to launch a coordinated campaign to get their spot and may have higher ambitions. For other states, you’re talking about someone who was willing to show up. Here’s the data if you’re in to that sort of thing. I got the salary data here, the state population data here and the number of seats in the house here. As always, please update me if you see any errors! Welcome to “From the Archives”, where I dig up old posts and see what’s changed in the years since I originally wrote them. I’ve had a rather interesting couple weeks here in my little corner of the blogosphere. A little over a year ago, a reader asked me to write a post about a video he had seen kicking around that used gumballs to illustrate world poverty. With the renewed attention to immigration issues over the last few weeks, that video apparently went viral and brought my post with it. My little blog got an avalanche of traffic and with it came a new series of questions, comments and concerns about my original post. The comments on the original post closed after 90 days, so I was pondering if I should do another post to address some of the questions and concerns I was being sent directly. A particularly long and thoughtful comment from someone named bluecat57 convinced me that was the way to go, and almost 2500 something words later, here we are. As a friendly reminder, this is not a political blog and I am not out to change your mind on immigration to any particular stance. I actually just like talking about how we use numbers to talk about political issues and the fallacies we may encounter there. Note to bluecat57: A lot of this post will be based on various points you sent me in your comment, but I’m throwing a few other things in there based on things other people sent me, and I’m also heavily summarizing what you said originally. If you want me to post your original comment in the comments section (or if you want to post it yourself) so the context is preserved, I’m happy to do so. Okay, with that out of the way, let’s take another look at things! The number of poor people was not accurate. I believe it may have been at one point, but since the video is 7 years old and world poverty has been falling rapidly, they are now wildly out of date. I don’t blame Beck for his video aging, but I do get irritated his group continues to post it with no disclaimer. That the argument the video starts with “some people say that mass immigration in to the United States can help reduce world poverty” was not a primary argument of pro-immigration groups, and that using it was a strawman. That people liked, shared and found this video more convincing than they should have because of the colorful/mathematical demonstration. My primary reason for posting about the video at all was actually point #3, as talking about how mathematical demonstrations can be used to address various issues is a bit of a hobby of mine. However, it was my commentary on #1 and #2 that seemed to attract most of the attention. So let’s take a look at each of my points, shall we? Point 1: Poverty measures, and their issues: First things first: when I started writing the original post and realized I couldn’t verify Beck’s numbers, I reached out to him directly through the NumbersUSA website to ask for a source for them. I never received a response. Despite a few people finding old sources that back Beck up, I stand by the assertion that those numbers are not currently correct as he cites them. It is possible to find websites quoting those numbers from the World Bank, but as I mentioned previously, the World Bank itself does not give those numbers. While those numbers may have come from the World Bank at some point he’s out of date by nearly a decade, and it’s a decade in which things have rapidly changed. Basically he made the argument in the middle of an unprecedented fall in world poverty. Again, not his fault, but it does suggest why he’s not updating the video. The argument would seem a lot weaker starting out with “there’s 700 million desperately poor people in the world and that number falls by 137,000 people every day”. The $2/day metric is a measure of consumption, not income and thus is very sensitive to price inflation. Consumption is used because it (attempts to) account for agrarian societies where people may grow their own food but not earn much money. Numbers are based on individual countries self-reporting. This puts some serious holes in the data. The definition is set based on what it takes to be considered poor in the poorest countries in the world. This caused it’s own problems. That last point is important enough that the World Bank revised it’s calculation method in 2015, which explains why I couldn’t find Beck’s older numbers anywhere on the World Bank website. Prior to that, it set the benchmark for extreme poverty based off the average poverty line used by the 15 poorest countries in the world. The trouble with that measure is that someone will always be the poorest, and therefore we would never be rid of poverty. This is what is known as “relative poverty”. Given that one of the Millennium Development Goals focused on eliminating world poverty, the World Bank decided to update it’s estimates to simply adjust for inflation. This shifts the focus to absolute poverty, or the number of people living below a single dollar amount. Neither method is perfect, but something had to be picked. It is worth noting that country self reports can vary wildly, and asking the World Bank to put together a single number is no small task. While the numbers presented, it is worth noting that even small revisions to definitions could cause huge change. Additionally, none of these numbers address country stability, and it is quite likely that unstable countries with violent conflicts won’t report their numbers. It’s also unclear to me where charity or NGO activity is counted (likely it varies by country). Interestingly, Politifact looked in to a few other ways of measuring global poverty and found that all of them have shown a reduction in the past 2 decades, though not as large as the World Bank’s. Beck could change his demonstration to use a different metric, but I think the point remains that if his demonstration showed the number of poor people falling rather than rising, it would not be very compelling. Edit/update: It’s been pointed out to me that at the 2:04 mark he changes from using the $2/day standard to “poorer than Mexico”, so it’s possible the numbers after that timepoint do actually work better than I thought they would. It’s hard to tell without him giving a firm number. For reference, it looks like in 2016 the average income in Mexico is $12,800/year . In terms of a poverty measure, the relative rank of one country against others can be really hard to pin down. If anyone has more information about the state of Mexico’s relative rank in the world, I’d be interested in hearing it. Point 2: Is it a straw man or not? When I posted my initial piece, I mentioned right up front that I don’t debate immigration that often. Thus, when Beck started his video with “Some people say that mass immigration in to the United States can help reduce world poverty. Is that true? Well, no it’s not. And let me show you why…..” I took him very literally. His demonstration supported that first point, that’s what I focused on. When I mentioned that I didn’t think that was the primary argument being made by pro-immigration groups, I had to go to their mission pages to see what their argument actually were. None mentioned “solving world poverty” as a goal. Thus, I called Beck’s argument a straw man, as it seemed to be refuting an argument that wasn’t being made. “The premise is false. What the pro-immigration people are arguing is that the BEST solution to poverty is to allow people to immigrate to “rich” countries. That is false. The BEST way to end poverty is by helping people get “rich” in the place of their birth. Love the last sentence in particular, and I couldn’t agree more. My “clear definitions” tag is one of my most frequently used for a reason. In that spirit, I wanted to explain further why I saw this as a straw man, and what my actual definition of a straw man is. Merriam Webster defines a straw man as “a weak or imaginary argument or opponent that is set up to be easily defeated“. If I had ever heard someone arguing for immigration say “well we need it to solve world poverty”, I would have thought that was an incredibly weak argument, for all the reasons Beck goes in to….ie there are simply more poor people than can ever reasonably be absorbed by one (or even several) developed country. Given this, I believe (though haven’t confirmed) that every developed/rich country places a cap on immigration at some point. Thus most of the debates I hear and am interested in are around where to place that cap in specific situations and what to do when people circumvent it. The causes of immigration requests seem mostly debated when it’s in a specific context, not a general world poverty one. Now there are a lot of issues at play with all of these, depending on who you talk to: general immigration policy, executive power, national security, religion, international relations, the feasibility of building a border wall, the list goes on and on. Poverty and economic opportunity are heavily at play for the first one, but so is the issue of “what do we do when people circumvent existing procedures”. In all cases if someone had told me that we should provide amnesty/take in more refugees/lift a travel ban for the purpose of solving world poverty, I would have thought that was a pretty broad/weak argument that didn’t address those issues specifically enough. In other words my characterization of this video as a straw man argument was more about it’s weakness as a pro-immigration argument than a knock against the anti-immigration side. That’s why I went looking for the major pro-immigration organizations official stances….I actually couldn’t believe they would use an argument that weak. I was relieved when I didn’t see any of them advocating this point, because it’s really not a great point. (Happy to update with examples of major players using this argument if you have them, btw). In addition to the weaknesses of this argument as a pro-immigration point, it’s worth noting that from the “cure world poverty” side it’s pretty weak as well. 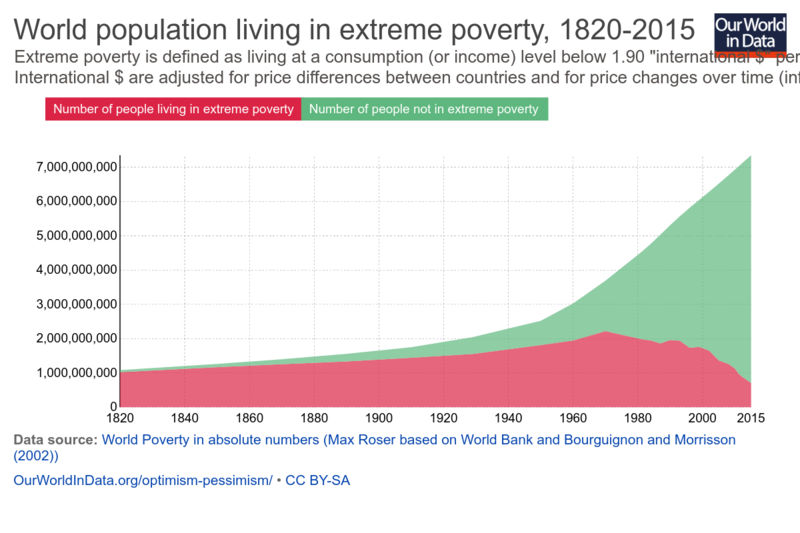 I mentioned previously that huge progress has been made in reducing world poverty, and the credit for that is primarily given to individual countries boosting their GDP and reducing their internal inequality. Additionally, even given the financial situation in many countries, most people in the world don’t actually want to immigrate. This makes sense to me. I wouldn’t move out of New England unless there was a compelling reason to. It’s home. Thus I would conclude that helping poor countries get on their feet would be a FAR more effective way of eradicating global poverty than allowing more immigration, if one had to pick between the two. It’s worth noting that there’s some debate over the effect of healthy/motivated people immigrating and sending money back to their home country (it drains the country of human capital vs it brings in 3 times more money than foreign aid), but since that wasn’t demonstrated with gumballs I’m not wading in to it. So yeah, if someone on the pro-immigration side says mass immigration can cure world poverty, go ahead and use this video….keeping in mind of course the previously stated issue with the numbers he quotes. If they’re using a better or more country or situation specific argument though (and good glory I hope they are), then you may want to skip this one. Now this being a video, I am mindful that Beck has little control over how it gets used and thus may not be at fault for possible straw-manning, any more than I am responsible for the people posting my post on Twitter with Nicki Minaj gifs (though I do love a good Nicki Minaj gif). Welp, this went on a little longer than I thought. Despite that I’m sure I missed a few things, so feel free to drop them in the comments! I’ve seen a lot of talk about the Electoral College this past week, and discussion about whether or not the system is fair. 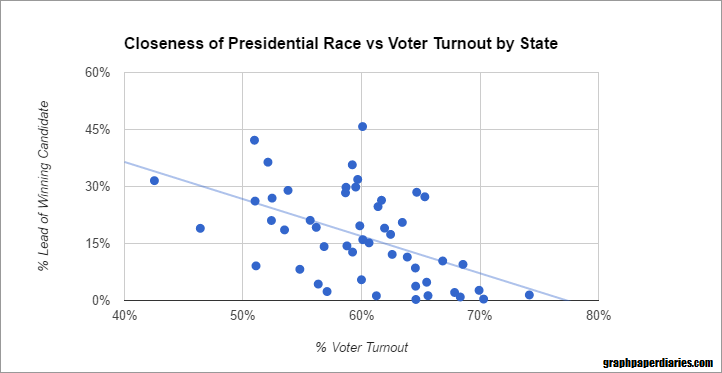 I’m not particularly going to wade in to this one, but I did get curious if the closeness of the presidential race in a state influenced voter turnout overall. Under the current system, it would stand to reason that voters in states that have large gaps between the two parties (and thus know ahead of time which way their state is going to go) would be less motivated to vote than those living in states with close races. While other races are typically happening in most states that could drive voter turnout, we know that elections held during the presidential election have better turnout than midterm elections by a significant margin. The idea that being able to cast a vote for the president is a big driver of turnout seems pretty solid. What I wanted to know is if the belief that you’re going to count a potentially “meaningful” vote in an election an even further driver of turnout. With all the commentary about the popular vote vs electoral college and with some petitioning to retroactively change the way we count the votes, it seemed relevant to know if the system we went in to voting day with had a noticeable impact on who voted. The r-squared is about 26.5% for an r of .5. I didn’t take in to account any other races on the ballot, but I think it’s safe to at least theorize that believing your state is a lock in one direction or the other influences voter turnout. Obviously this provides no comment on how other systems would change things from here, only how people behave under the system we have today. It’s interesting to note that the Utah vote got split by McMullin, so the percent lead there is a bit skewed. The average turnout in states where the presidential race was close (<5% between the winning candidate and second place) was 65% vs 58% for all other states. A quick ANOVA tells me this is a statistically significant difference. Once the gap between the winner and second place gets over 10%, things even out. 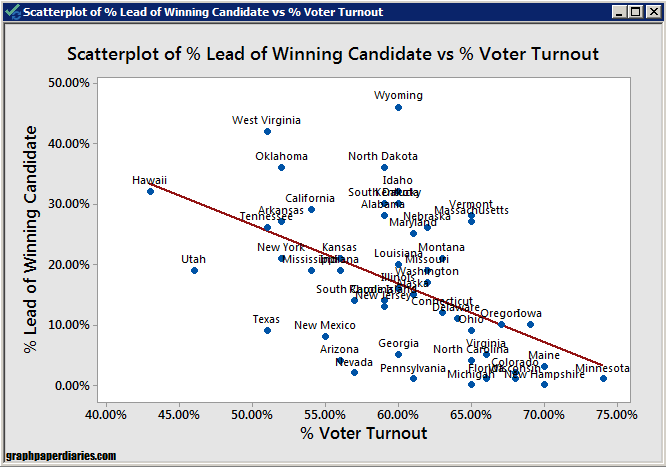 States with a gap of 10-20% have about 58% voter turnout, and those with an over 20% gap have about a 57% voter turnout. Some of this may be even out as states with large gaps also likely take their time with counting their votes. My state (Massachusetts) is one of the weird lopsided but high turnout states, and we had some really contentious ballot questions: charter schools expansion and recreational marijuana. Again, none of this speaks to whether or not the process we have is a good one, but it’s important to remember that the rules in play at the time people make a decision tend to influence that decision. I’ll update the post if these margins change significantly as more votes are counted. It’s election day here in the US, so I thought I’d do a roundup of my favorite posts I’ve done in the past year about the political process and it’s various statistical pitfalls. Regular readers will recognize most of these, but I figured there were worth a repost before they stopped being relevant for another few years. As always, these posts are meta/about the process type posts, and no candidates or positions are endorsed. The rest of you seem to have that covered quite nicely. How Do They Call Elections So Early? My most popular post so far this year, I walk through the statistical methods used to call elections before all the votes are counted. No idea if this will come in to play today, but if it does you’ll be TOTALLY prepared to explain this at your next cocktail party or whatever it is the kids do these days. 5 Studies About Politics and Bias to Get You Through Election Season In this post I do a roundup of my favorite studies on, well, politics and bias. Helpful if you want to figure out what your opponents are doing wrong, but even MORE helpful if you use it to re-examine some of your own beliefs. Two gendered voting studies. People love to study the secret forces driving individual genders to vote certain ways, but are those studies valid? I examined one study that attempted to link women’s voting patterns and menstrual cycles here, and one that attempted to link threats to men’s masculinity and their voting patterns here. Spoiler alert: I was underwhelmed by both. Two new logical fallacies (that I just made up) Not specific to politics, but aimed in that direction. I invented the Tim Tebow Fallacy for those situations when someone defends a majority opinion as though they were an oppressed minority. The Forrest Gump Fallacy I made up for those times when someone believes that their own personal life is actually reflective of a greater trend in America….when it doesn’t. My grandfather making fun of statistical illiteracy of political pundits 40 years ago. The original stats blogger in my family also got irritated by this stuff. Who would have thought. As a final thought, if you’re in the US, go vote! No, it won’t make a statistically significant difference on the national, but I think there’s a benefit to being part of the process.